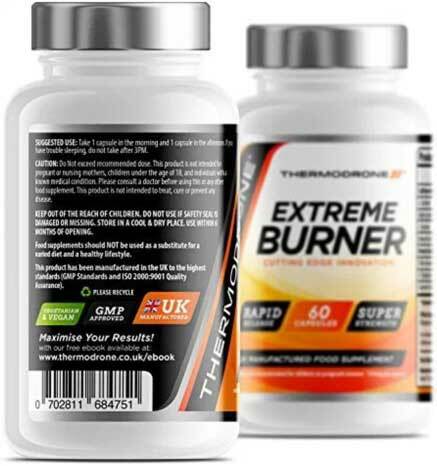 Thermodrone Extreme Burner is a cheap diet pill available from Amazon. It’s one of four supplements brought to market by Green Global Direct and distributed under the Thermodrone brand name. According to the Green Global Direct website, the company is an online retail and distribution specialist; so it seems likely the products they are marketing are bought-in from elsewhere. The company also operates a Thermodrone website, but it doesn’t contain any product specifications or information. It merely provides links to sales pages at Amazon UK. These don’t provide a lot of information either, but a full list of ingredients is available and that’s a definite plus. L-Carnitine (150mg): An amino acid that has stimulatory abilities and is often added to energy drinks and smart drug formulations. Caffeine Anhydrous (150mg): Another energy drink ingredient. Caffeine is also a diet pill regular that boasts proven fat burning abilities. L-Tyrosine (100mg): An amino acid. L-Tyrosine is believed to possess appetite suppressing abilities, but the amount provided here may be too low to be of value. Green Tea Extract (50mg): Research proves green tea has the power to encourage fat loss, but the doses used are generally much higher. The volunteers who took part in a clinical trial carried out in Tokyo, were given 583mg per day. Brown Rice Flour (50mg): When it’s consumed as a food, brown rice may have the ability to support weight loss, but a tiny dose of brown rice flower is unlikely to have much to offer. Citrus Aurantium Whole Fruit (45mg): A stimulant and fat burner that’s obtained from a species of citrus fruit. L-Tryptophan (25mg): Research suggests supplementation with L-Tryptophan may reduce feeling of fatigue and boost physical performance. Cayenne Powder (1.5mg): Cayenne can benefit the health in many ways and has the ability to support weight loss by providing appetite suppression and boosting calorie burning ability. Opinions about this product vary. Some people say they believe it works well. Others say it doesn’t work at all and reports of side effects are quite common. Customers are advised not to take any capsules after 3pm because the caffeine content may interfere with sleep. Some customers claim they felt unwell due to using this product, and a number of side effects have been reported, but the most common problems appear to be disrupted sleep and feelings of nausea. We suggest avoiding using this product without a doctor’s approval. There are 60 capsules in a bottle, so each bottle will last for 30 days. The product is only available via Amazon and the price is £13.99 per bottle. This product is sold without a money back guarantee. Although the ingredients used in Thermodrone Extreme Burner have abilities that could combine to provide the kind of benefits users are promised, some of the inclusion rates are rather low. Results will suffer because of this and, unless you are exercising hard and paying close attention to what you eat, you may not see much (if any) difference at all. The formulation also contains a number of stimulants and the caffeine content alone may be too high for individuals who do not tolerate stimulants well. The amount of caffeine in a capsule is similar to that provided by 2×250ml cans of Red Bull and the capsules contain other stimulants as well. Customer reviews show the formulation is problematic for many users and suggest the results obtained my not be particularly good. Thermodrone Extreme Burner may may be a cheap diet pill, but using this product is likely to be more expensive in the long run and its negative aspects make it a poor option. 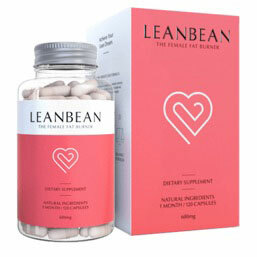 We suggest choosing another product instead and highly recommend Leanbean – a fat burner specifically created for women. Thousands of customer reviews show how well the formulation works, side effects are not an issue, and the product is backed by a 60-day money back guarantee.